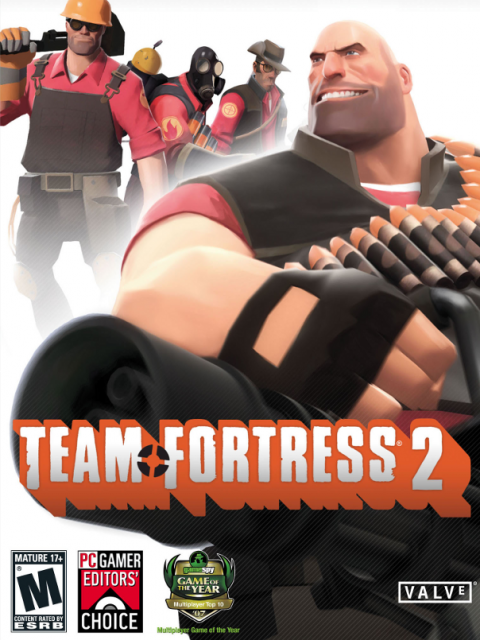 The long-awaited sequel to the class-based first-person shooter Team Fortress Classic sports a unique cartoony visual style, more accessible gameplay, and a very large amount of updates and new features since its original release. Valve's famous goofy multiplayer shooter launched in 2007. In April 2010, a "random drop" system appeared to disperse various cosmetics and weapons to players. September of that year introduced for-actual-money microtransactions and loot boxes to the game in the form of the "Mann Co. Crate". In 2011, the game switched to being entirely free-to-play. Cosmetic Items and unlock-able alternate weapons can be bought in the store, obtained through loot boxes, or obtained at a low rate via play. A system exists to create weapons out of duplicates, but it's very inefficient. Most items can be freely traded between players, so many third-party markets exist for in-game items. A small selection of specific weapons are given to players when they get certain Steam Achievements for the game. Unlockable weapons are generally designed to be side-grades, not upgrades, with most stock weapons generally being considered the most versatile overall. Valve's famous goofy multiplayer shooter launched in 2007. In April 2010, a "random drop" system appeared to disperse various cosmetics and weapons to players. September of that year introduced for-actual-money microtransactions and loot boxes to the game in the form of the "Mann Co. Crate". In 2011, the game switched to being entirely free-to-play. Cosmetic Items and unlock-able alternate weapons can be bought in the store, obtained through loot boxes, or obtained at a low rate via play. A system exists to create weapons out of duplicates, but it's very inefficient. Most items can be freely traded between players, so many third-party markets exist for in-game items. A small selection of specific weapons are given to players when they get certain Steam Achievements for the game. Unlockable weapons are generally designed to be side-grades, not upgrades, with most stock weapons generally being considered the most versatile overall.